Redlands, California—Esri, the global leader in spatial analytics, today honored three of its partners with its inaugural Federal Small Business Specialty (FSBS) Awards during the Esri Federal GIS (FedGIS) Conference. The awards recognize companies that use Esri technology to help the nation run more efficiently and transparently by innovating in areas such as indoor mapping and open data initiatives. 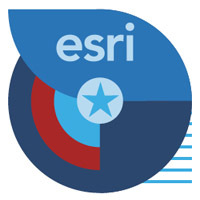 The Esri Partner Network, which helps members expand their technology offerings and increase sales, offers exclusive access to an array of spatial analysis resources. "We are excited about the amazing next generation solutions our small business partners deliver to federal government agencies," said Jeff Peters, head of national government at Esri. "Winners of the FSBS Awards have made great contributions to Esri's small business program by changing the way agencies think about solving their problems and making smarter decisions with geographic information systems." Winners will present their stories on February 14 at the Walter E. Washington Convention Center in Washington, DC. Find out more about how Esri helps companies use spatial analysis to solve the challenges of running their businesses, as well as those facing the world, by visiting esri.com/partners.